Mom's Grilled Sausage Patties Potatoes and Peppers are the best smell I remember her cooking as I child. Those flavors are etched in my mind forever. I will always miss her cooking. Even making it myself will never duplicate mom's flavors. The smells when I came home from school with this baking in the oven was heavenly. You may remember Mom's Sausage Recipe? Well this is the same recipe just made into sausage patties adding peppers and potatoes. The addition of the peppers, mushrooms and potatoes make this a fantastic throw together meal. It's a perfect throw together meal when you just want something different. 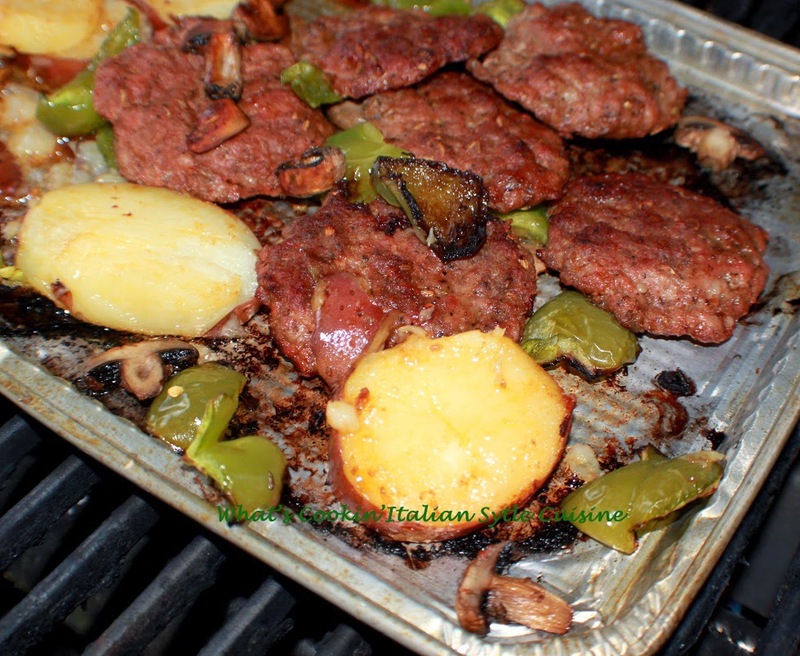 We always love Italian sausage patties grilled as an alternative to hamburgers. Everyone has their favorite memories of mom's homemade cooking. This is mine. Mom has her own business, it was a deli back in the 1950's. She made everything from scratch. Homemade dough, pastries, pasta's and sausage. I remember mom and dad stuffing the sausage by hand with a funnel. Good ole days. They didn't have a machine to do it. It was hard work. This is her quick sausage pattie recipe. I make it all the time. If you really want to use fattier meat you will need to add pork fat to this as it's not full of fat just flavor. If you want the authentic pork for sausage ask your butcher to grind the pork shoulder for you. That is the perfect cut. Ground pork is not as fatty but great in a pinch and healthier version. Make the sausage into patties, place on an aluminum grill pan sprayed with cooking oil. Sliced the microwave potatoes into 2 inch slices, add to the pan. Randomly place sliced mushrooms and peppers on the pan. Sprinkle with all the spices and herbs. Drizzle all over the top with olive oil. Grill until the sausage is crispy and no longer pink. You can also bake this inside on 400 degrees for around 35 minutes, that's how mom made this. Serve on rolls. This is comfort food at its best. Love it!